We have taken a week off from the hustle and bustle of finishing the building of our townhouse, the preparations to move to Talisay City and flew off to Singapore for a week of R&R. It has been quite a reprieve from the disorganized mayhem of the Philippines. 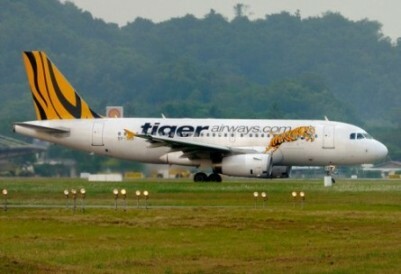 Tiger Airways has excellent and inexpensive, direct service from Cebu City's Mactan International Airport to Singapore's Changi Airport (Budget Terminal). Unlike Cebu Pacific and AirPhil Express, they fly in the middle of the day and not in the middle of the night. We left Cebu at 12:30 in the afternoon on September 7 and arrived at 4:20 PM in Singapore. Tiger Airways is a budget carrier, so you will have to pay for extras, such as checked baggage, first boarding, preassigned seats, drinks and food but the service is excellent, the aircraft are new, clean and comfortable and their on-time arrival record is very good. Changi airport is probably one of the world's best, most well-organized airports. Neither US nor Philippines citizens need a visa for Singapore, so Immigration and Customs was a breeze. Free shuttle bus takes you from the Budget Terminal to Terminal 2, where one can connect to the Singapore public transport system (MRT station in the basement, bus depot at ground level). You can purchase an ez-link (CEPAS) card at the MRT Ticket Office (S$5 plus S$7 load) valid for trains and buses all over the city. There are no terminal use fees or departure taxes at Changi Airport, only excellent restaurants, stores and great (really) duty free shopping! We took a Tiger Airways cross-border bus from the Budget Terminal to Johor Bahru, Malaysia. We had free promotion (now expired) tickets, normally S$7 each person. The bus stops at Singapore's Woodlands Checkpoint for exit processing, then crosses the causeway to Malaysia, stopping again at the Malaysian Sultan Iskandar Complex (JB Sentral) checkpoint for inbound immigration. No visa is required for US or Philippines citizens. Our hotel (Suria City Hotel) is a short walk from JB Sentral. We booked the Suria City Hotel via Agoda.com for five nights for US$163.15 total, or $32.63 per night. The same room would have cost us over $150 per night in Singapore. The room was large, clean and comfortable with all the requisite amenities (free LAN internet, cable is available for a MYR 10 deposit). The service was OK, nothing exceptional but no complaints, either. Johor Bahru's City Square Mall (one of its largest) is directly connected to JB Senter (via an overpass) and it offers many restaurants and shopping opportunities. There is also a small supermarket at the lower level. Prices are generally lower in Malaysia then in Singapore. For example, a pack of Marlboro cigarettes cost S$10 in Singapore (just over US$8) but in Malaysia the price is MYR 10 (about US$3.30). Only one open pack of cigarettes is allowed to be imported into Singapore per person and they do check at the border. 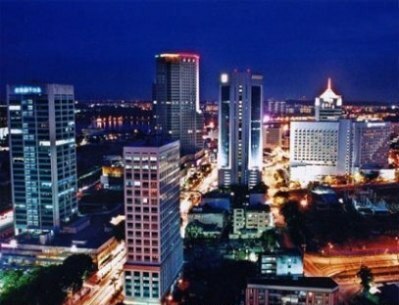 We felt quite safe in Johor Bahru, even though it is a predominantly Muslim country and we were there on September 11. We had no unpleasant incidents anywhere. The city is quite cosmopolitan with excellent services although it does not compare with Singapore. The food is very good and transportation is easy. Public buses run anywhere and taxis are inexpensive (MYR 3 base fare, 20 ringgit will get you all the way across the city). Most every day we crossed into Singapore. A short walk from our hotel to JB Senter where we exited Malaysia and took a Singapore SMRT bus (950) across the causeway to Woodlands Checkpoint in Singapore where we cleared immigration and got back on bus 950. It terminates at the Woodlands Interchange, where we caught the MRT Red (NS) line which goes into Singapore city center. We bought ez-link cards for S$25 each, it got us all over Singapore for 5 days (trains and buses) and when we left, we still had S$5 refunded to us. We traveled all over the island, visited Sentosa Island and many sites. The ez-link card is one of the best travel bargains around. Singapore is simply phenomenal. It is a vibrant, bustling city with exceptional services (transportation, government, hospitality, commerce, recreation, etc.) It is a society that works and works well. I was prepared for a police state yet I saw no police presence anywhere except at the border checkpoint. Getting around is easy, the language is English (mostly, albeit Chinese and Malay are spoken and can be seen everywhere). The city is clean and very comfortable. Traffic moves and there is no smog. Singapore is also expensive, especially when compared to the Philippines or Malaysia. 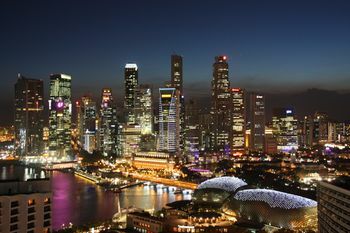 One of the most striking things about Singapore is the vast diversity. Westerners, Malays, Chinese, Pacific Islanders, Indians all live together in apparent harmony in this small island nation which has no resources yet is boasts a thriving economy. Muslims proudly display their flag on their apartments and houses, many languages can be heard in various public places. It's a one great experience! I'm so blessed and lucky to visit Johor Bahru and Singapore..
Nice, informative blog, thanks for sharing your trip. We are bound for Johor in April with 3 kids ages 7 to 15. We plan to do the same thing, cross to Singapore daily to save on hotel cost. Would you recommend Suria Hotel for family with kids? Ricky, you did not leave your email, so here is my reply. Yes, I would recommend the Suria Hotel, albeit it is a bit of a walk to City Center. You have to follow a well-worn footpath once you walk down a small hill, then cross a 4-lane highway (not busy at all) to get to City Center. Taxi is an alternative, but you have to get the bellman to call one for you.